The last month was amazing. We (that is Alexander Bischof and me) have been on tour for JavaLand 4 Kids and for Devoxx 4 Kids. These kids are awesome and every single event we prepare for the kids makes it even more of a pleasure for us. As you can guess from the name, the JavaLand 4 Kids took place during to the famous JavaLand conference in Phantasialand in Cologne on 2015-03-24. It was inspired by the Devoxx 4 Kids and organized alongside the rest of the conference by DOAG. It was just by chance that this event came to our attention, but we immediately agreed it would be good idea take part and use another opportunity to teach and inspire the kids. 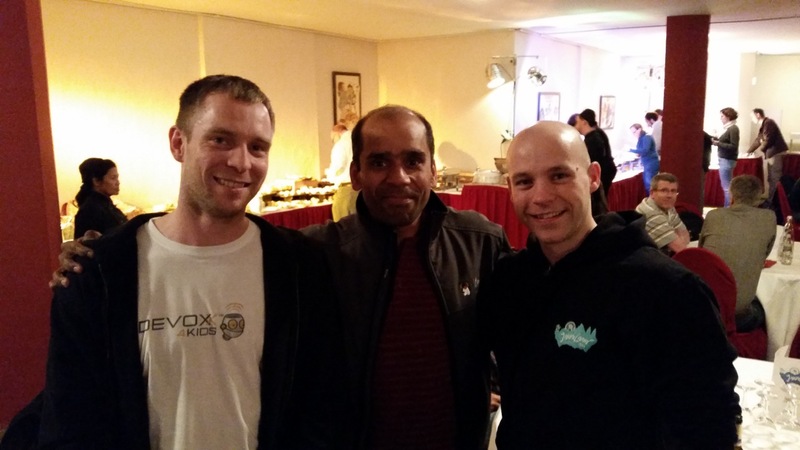 During dinner we sat close to Arun Gupta, who is one of the initiators and driving forces behind the Devoxx 4 Kids. Fried Saacke, chairman of the conference team, stated that he would like to introduce JavaLand 4 Kids as integral part of the JavaLand conference and we are looking forward to next year’s JavaLand 4 Kids already. Events like the Devoxx 4 Kids and JavaLand 4 Kids are invaluable for the kids. They are so grateful and clever. The kids literally cling to your lips awaiting to be taught more and more. We truly enjoy taking place in these events, since the atmosphere with the other coaches and the kids is inspiring. More importantly however, there has been some buzz around the 4-Kids events recently. The media feedback for the JavaLand was enormous, which greatly helps in spreading the idea of the Devoxx 4 Kids. Moreover, we can be proud that we had a significant participation of girls in both events. We hope this continues. What did we do with the kids? We introduced the kids to the Internet of Things and showed them how to work with the electronic parts of Tinkerforge. Tinkerforge provided the materials the kids played with during JavaLand 4 Kids and Devoxx 4 Kids. You can find out more about our workshop in the official Devvox 4 Kids repository and read more about it in an article about the Devoxx 4 Kids of last fall. This is a good place to say thank you. Thank you, Tinkerforge, for providing the materials for the kids! Fortunately there are more events already planned. There will be a Devoxx 4 Kids in Hamburg on 2015-06-06.